See here the list of all of Suez Canal transit cruises 2019 and 2020 ships schedule, lines and transition itineraries (ports of call). Most Suez cruises offer cheap deals on one-way transit itineraries between Europe (Mediterranean) and Asia (Dubai, India, Singapore or even China). Some transits are part of World Cruises, transiting Suez Canal. Repositioning cruise ships through Suez Canal provide a range from “affordable luxury” to really cheap big-sized ship travel deals. Not to forget this is an unique opportunity to enjoy cruising to exotic destinations at some of the market’s best rates. Representing a very small segment of all cruise ships repositioning deals, Suez cruises may also be segments of Around the World cruises. These special voyages are usually starting in the beginning of each year by some of the world’s major brands, and done mostly by luxury cruise lines ships. Passing through the Suez Canal is an unique experience related not only to cruising, but also to the Africa-Asia region itself. The Egypt Nile cruise deals may be booked separately (they are optional) offering the not necessarily cheap, but always so much exotic Alexandria and Cairo tours and excursions. The Egyptian resorts on the Red Sea offer the unique chance to sample so many things in this ancient region. You can perfectly combine visiting the Pharaoh’s mysterious kingdom, enjoying the beautiful shores, the amazing coral reef and marine life with luxury ship amenities and stylish experiences on board. The diving holidays in Red Sea are also very popular though optional Red Sea vacation deal. Know that snorkeling, scuba diving, wind surfing, sailing, glass-bottom boats, and even submarine trips are at their very best in the Suez Canal region. And, of course, the numerous archaeological sites, museums, the desert safaris. Not to forget the great night-life in major coastal towns. from Safaga (Hurghada, El Gouna, Sahl Hashish, Giftun Island), Marsa Alam (has an air-port). the Southeastern Coast (El Quseir, Marsa Alam, Hamata). Best for Red Sea diving trips is the coastal area between El Gouna and Safaga. The reason is this area perfectly combines the region’s amazing reefs and wrecks with the convenient proximity to the Egypt’s most famous historical sites for touring – Luxor and Cairo. 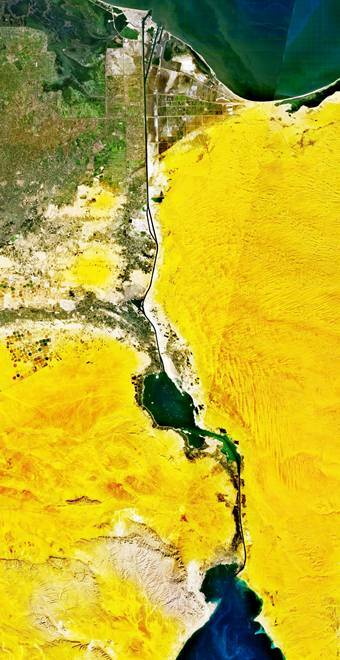 Suez Canal is artificial waterway in Egypt, which is sea-level and connects Mediterranean and Red Seas. In November 1869 Suez Canal was available for sailing after ten-year construction works. 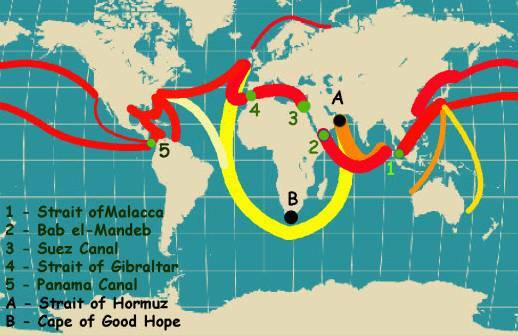 The Canal allows vessel transport between Asia and Europe without around Africa navigation. Port Said is northern terminus; Port Tawfiq is southern terminus at the Suez city; Ismailia lies on west bank of Suez Canal, 3 km from half-way point. After first built, the canal was long 164 km, 8 m deep. After a great deal of enlargements, as of 2010, it is long 193.30 km, 24 m deep, 205 m wide. Suez Canal consists of a northern access channel (22 km), the canal itself (162.25 km), and a southern access channel (9 km). The Canal acts for single lane which has passing places in Great Bitter Lake and “Ballah By-Pass”. There are no locks and seawater freely flows through canal. Generally, north of Bitter Lakes the canal flows south in summer and north in winter. South of lakes the current changes with tide at Suez. The canal is maintained and owned by SCA (Suez Canal Authority of Egypt) and is under international treaty. It may be used in peace and war times, by every vessel of war or of commercial ships without flag distinction. Learn more at Wikipedia. On February 24, 2016, a new Suez Canal shipping lane was inaugurated by the canal’s authority. The new line is parallel to Port Said and effectively lowers canal transition times. It allows vessels to sail in both directions and increases the containership traffic. In 2015, the canal was expanded at the cost of USD 8,5 billion. However, the low crude oil price now allows cargo ships to avoid paying the costly Suez Canal transition prices (USD 465,000 on average) by taking the long way around South Africa instead. Between October 2015 and February 2016, a total of 115 westbound cargo vessels loaded with goods from Asia to Northern Europe or USA took the around Africa route instead of transiting the canal. Statistics show that the South African route saves USD 235,000 on average per voyage. The Suez Canal Authority reported for 2015 an increased number of passing ships (17483 vessels, or 2% increase). The report also says a decreased number of bulk cargo (5,7%) and container cargo ships (3,1%). To compete with the falling oil prices, Suez Canal would need to cut transition prices by roughly 50%. The South African shipping route has a big environmental impact. It was calculated that the route’s increased fuel consumption results in additional 6800 tons of CO2 on average per voyage. 1. cargo cruise from Singapore to Barcelona – visits Piraeus (for Athens), Naples and Genoa. 4. cruise from India (Mundra port departure) to Southampton UK – visits Salalah, Djibouti, Jeddah, Malta, and Tangier. Choose a Freighter Cruise from AU$4,600 for 23 days through the Suez Canal. This option includes a voyage by freighter from Asian port to Europe. You can return back to Asia on the same vessels. Note that cabins continuing to Sydney or Melbourne from Europe are booked usually six months in advance. Felixstowe Freighter Voyage via the Suez from Asia to Europe offers all year round weekly departures via Suez Canal in either direction. The tariff from AU$4,600 pp includes meals and port fees. For booking or inquiries call: 02 8270 4899. Onboard facilities include open deck area, passenger lift, TV/VCR room, passenger lounge, self-service laundry, indoor pool and sauna, fitness room (with table tennis, exercise bicycle, rowing machine). Special requirements imposed for yellow fever injection and travel insurance which are compulsory. Passengers have to possess valid passport (at least six months validation). Choose a Freighter Cruise from AU$5,730pp for 48 days through the Suez Canal. This option includes a voyage by freighter from Australian port to Europe. The Round-trip duration is 91 days for AU$10,180 pp. For each voyage four cabins are available (one single, two double bed, one twin bed) but there are only four cruises per year, so book early. Visit Geno, Italy and Chenai, India with Freighter Expeditions. For booking or enquiries call: 02 8270 4899. All cabins are carpeted, with air conditioning, small refrigerator, wardrobe, desk, and chair. Facilities include an elevator, small fitness room plus sauna, outside pool, and onboard steward. Special requirements imposed for yellow fever injection and travel insurance which are compulsory. Passengers have to possess valid passport (at least six months validation). A visa required for Sri Lanka, India, and Egypt. The ship only takes up to 79 years of age. On container ships accepted for carriage are only travelers of good physical and mental health. Container ships don’t provide a medical officer or doctor onboard, only basic first aid treatment is available. You can share/like/rate our Suez Canal cruises review via the social buttons. Follow us on the main social networks for latest updates (more transition dates to be announced soon). Happy vacations, and best luck with the ship relocation deals – to enjoy the magical combination of Egypt, Red Sea and the Mediterranean at more reasonable prices!